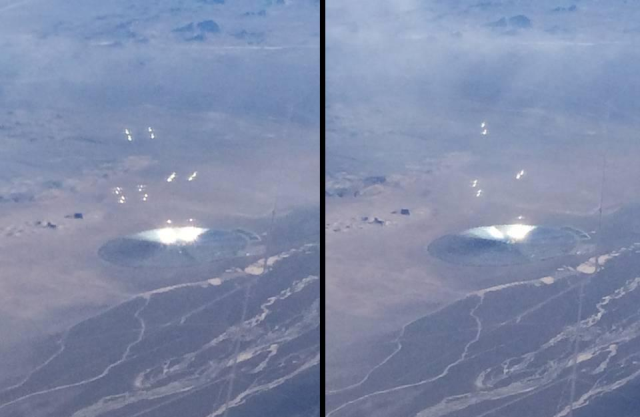 I was on an American Airlines flight from San Jose, Ca to Houston, TX on Oct 30, 2015 when I noticed a blinding bright light in the desert near Luning and Gabbs, NV. I watched the object as the plane advanced. I saw a large silver disc that appeared to be in the middle of the desert. This disc was shooting orb like lights into the air. The disc itself had multiple lights that were blinding to the eyes. I pulled out my phone and took pictures until my phone died. I had a full battery but was only able to get 6 pictures before my phone was depleted. The captain never said a word and the plane advanced until the object was behind the mountain range. No other passengers seem to notice the disc or comment on it. Detailed image of the Unusual Disc - UFO? - (Colors Enhanced). Upon my return home; I asked multiple Air Force employees if they have ever seen anything like this and all replied never. Initially I thought it was a satellite, but now leave it up to your interpretation. What did I witness? Mufon case 72656. It looks like a solar power plant. go away delmo you are worthless lol what the hell ... its clearly something advanced technology experiments going on over there ... does a solar power plant shooting orb like light sources into the air ? are you dumb Delmo ? No I´m not. I’m just saying that looks like a solar Power plant. What is happening above it its another thing that I can’t say what it is. This is, or should be, a space for DISCUSSION. I am worthy, intelligent and adult enough to say my name and discuss things without being rude with whom I do not know. Trooper Chick to me it looks like the orbs are reflections from the airplane windows while the silver thing is a very big array of mirrors concentrating the light to a huge tower in the middle. 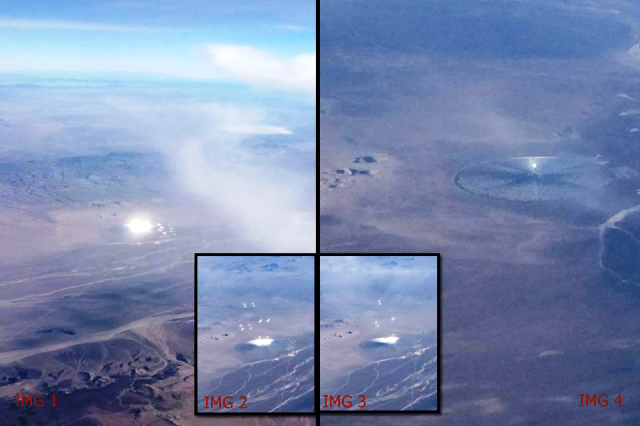 Maybe watch Sahara or other movies containing this type of solar power plants. It is clearly on the ground. This is a solar power plant 6 miles from Tonopah, Nevada. 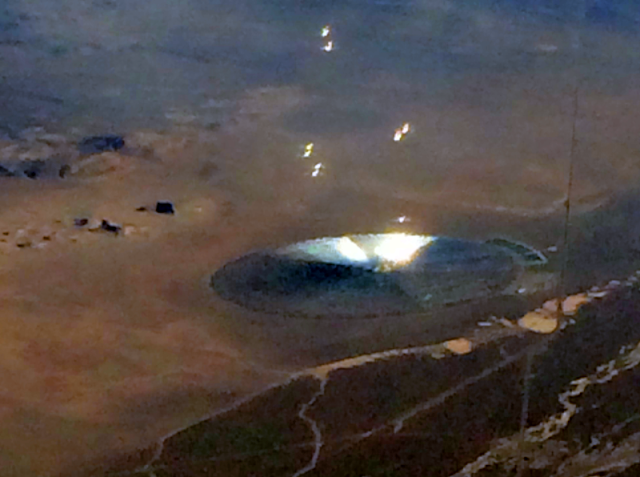 Google up Tonopah solar power plant. Problem solved!